1783 In England, a process for faster steel production is invented. 1783 Goya paints Portrait of Count Floridablanca. 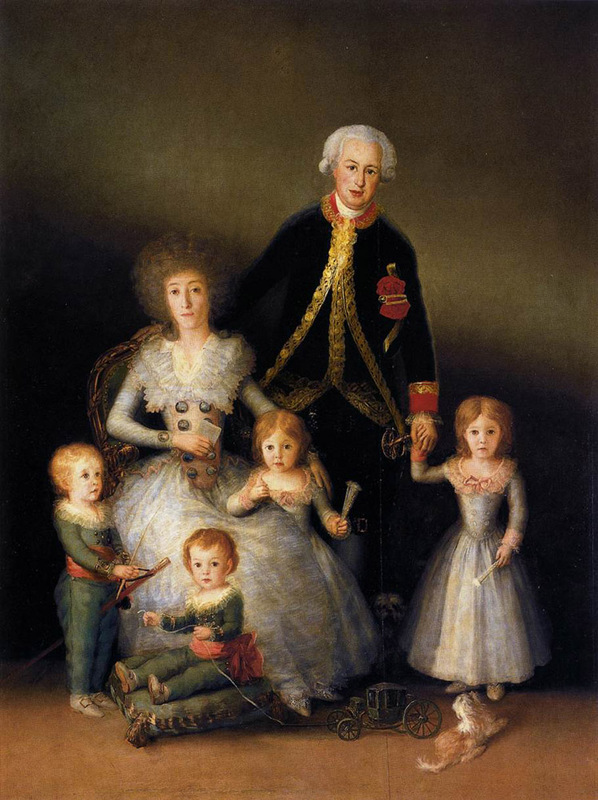 Spends a period with Don Luis de Borbon, where he paints a family portrait. 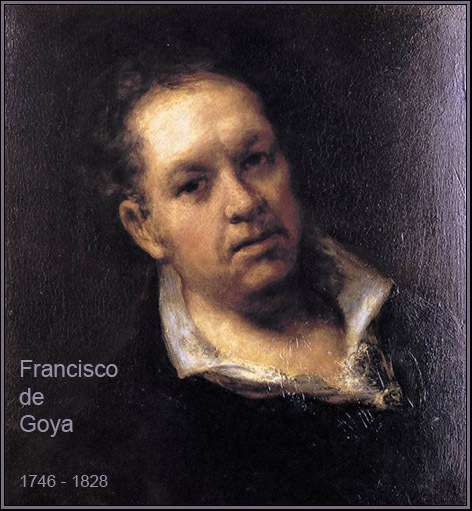 1784 Birth of his son, Francisco Javier Goya. 1785 First commission from the Dukes of Osuna. 1785 In England, The Times is first published. 1786 Death of Frederick II of Prussia. 1786 Appointed a painter to the king; begins a new series of tapestry designs for the El Pardo Palace. 1787 Premiere of Mozart's opera Don Giovanni, in Venice. 1789 Rises to the position of Court Painter. Paints the portrait of the new royal couple, Charles IV and Maria Luisa. 1789 The storming of the Bastille, which begins the French Revolution. George Washington becomes the first President of the USA. Coronation of Charles IV and Maria Luisa in Spain. 1791 In Poland, the first written constitution in Europe is adopted. 1791 Works on his last tapestry designs. 1792 An early form of telegraph is developed. After Goya had become a member of the Madrid Academy he turned his attention to finding new patrons in Madrid's high society. An important step to this end was the official portrait that Count Floridablanca, the king's first minister, commissioned from him. Goya, who till now had had little opportunity to paint portraits, was soon to become one of the most sought-after portraitists in Madrid, particularly among the aristocracy. He was noticed by wealthy patrons who were willing to pay prices Goya would previously never have dreamed of asking. In addition to his portraits, Goya also designed more tapestries for the Royal Manufactory. At 40, Goya was entering a successful, happy, and carefree period of his life. His social position became more stable when, after Charles IV's accession to the throne, he was appointed Court Painter and commissioned to paint the official portrait of the new royal couple, Charles IV and Maria Luisa. In 1786 Goya wrote to his friend Martin Zapater: "I have now established myself in a most enviable manner. Those who require something of me must seek me out - I remain apart. I work for no one unless he is a high ranking personality or a friend. Yet the more I play hard to get, the less they leave me in peace, and 1 do not know how I am to proceed." This was an astonishing achievement for a painter from the provinces who, just a few years before, had been glad of employment as a tapestry designer. An important step on his road to being the leading portraitist of Madrid high society was the large portrait commissioned by Count Floridablanca, one of the most influential men in Spain. There was a great demand for impressive portraits from the aristocracy, since images displaying their status were an important part of their family traditions. In contrast to the often-penniless hidalgos, the higher aristocracy, to which the 119 families of the so-called "grandees" belonged, possessed immeasurable wealth. One of Goya's first patrons, Don Luis de Borbon, lived apart from the Madrid court, at his country seat, because, as the king's brother, he had married a woman from the lower aristocracy. He had himself and his family painted by Goya, and invited the painter to spend the summers of 1783 and T784 at his home. "These princes are angels," Goya wrote to his friend Zapater. He invested his fee, the fantastic sum of 30,000 reales, in shares. Among Goya's most faithful benefactors were the Dukes of Osuna, who over the years ordered 30 paintings from him. Goya could now afford a splendid lifestyle, with elegant clothes and a fashionable carriage. For Goya himself a new world was opening up. Till now he had basically been an unpolished, uncultivated artisan, who saw his work as an elevated form of craftsmanship and who instinctively enjoyed the pleasures of the simpler classes. In the trend-setting circles of Spanish society he began to view completely new cultural and intellectual horizons. 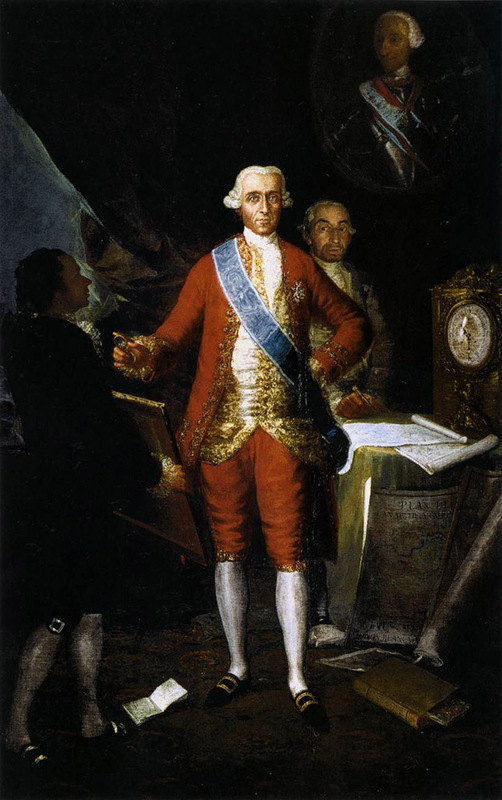 Goya's career as painter to the aristocracy began with this life-sized portrait of Secretary of State Floridablanca. Though still a rather stiff composition, the painting nevertheless complies with the expectation for an imposing official portrait. The luminous red stresses the power of the count. The maps indicate his project for a canal in the province of Aragon; a book on the art of painting shows him to be a connoisseurofart. Goya has painted himself (on the left of the painting) as a courtier presenting the count with a painting for his approval. The Dukes of Osuna belonged to the highest ranks of the Spanish aristocracy. The Duchess was one of the most brilliant women in Madrid and dressed elegantly, in the latest Paris fashion, and the salons she and her husband arranged were frequented by artists, intellectuals, and writers. The Duchess, an enthusiastic and open-minded connoisseur of new art, valued Goya's work very highly. In this large format portrait, Goya shows the family not in their luxurious palace but set against an indeterminate background that brings the individuals out in sharp relief. With the children unaffectedly holding their toys in their hands, the family portrait is at once intimate and yet dignified. Goya painted this picture as one of a series of country scenes for the Alameda Palace of the Dukes of Osuna. As with his tapestry designs. it is a depiction not of the entertainment of the aristocracy but of a village festival. Villagers have erected a tall greased pole that the boys are trying to climb. Prizes of chickens and pastries are dangling from the top. The inventiveness of the painting lies not least in the unusually bold use of the tall format. The slender form of the pole reaches far into the blue sky. The subject can be read as a symbol of human life, as well as a simple depiction of a popular form of entertainment. In July 1786, Goya reported triumphantly to Zapater, "Martin, I am now painter to the king, at a salary of 15,000 reales!" The new honor was in fact linked with an obligation to supply more designs for tapestries to the Santa Barbara tapestry manufactory, but now he would be paid a fixed annual salary for this. His first task was to design the decor for the dining room in the El Pardo Palace; the theme was one of the classic themes in art, the four seasons. 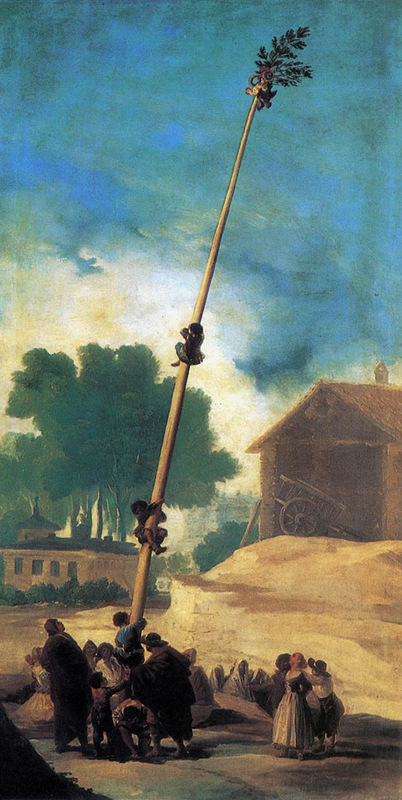 Goya adopted traditional motifs such as the grape harvest for the autumn, and haymaking for the summer. But he provided these traditional motifs with a wealth of realistic images. 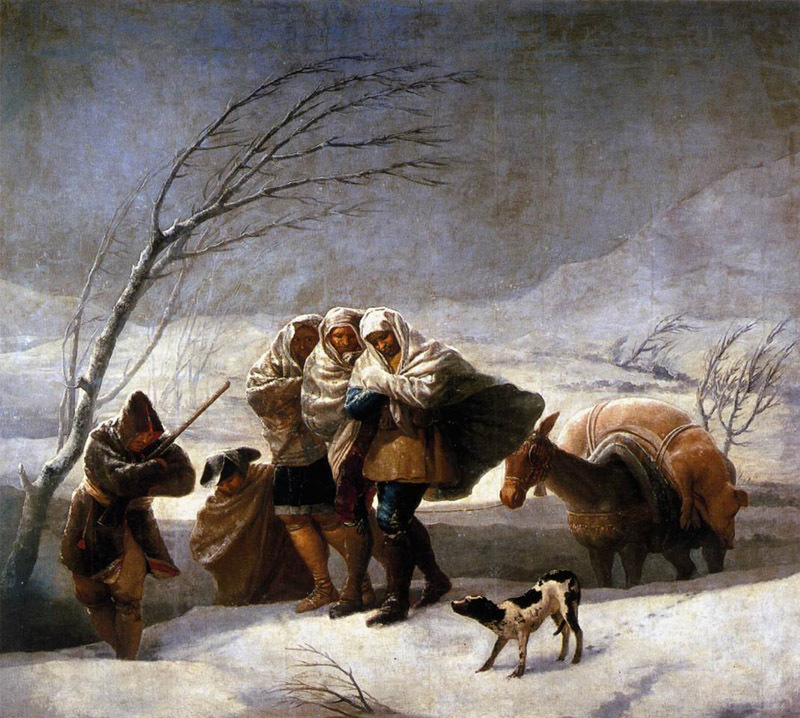 The painting for winter, for example, is a harsh representation of simple people battling against the elements. Next to it hung tapestries depicting a poor woman and her children, and even an injured mason. This new vision of the real world corresponded to an increasing awareness of social questions. A few years before, Charles III had promulgated a law on improving safety on building sites, and had declared that physical work, despite its low status in Spanish society, was not a dishonorable occupation. When, in 1791, Goya received a commission for a further series of tapestries, he refused it. He was now of the opinion that this kind of work was unworthy of him; after all, since 1789 he had been Court Painter. It was only when there was a threat to cut his salary that he declared himself ready to undertake the commission; but it was to be for the last time. In 1792 he became seriously ill and the series was never completed. He made his feelings known nonetheless. Some of those tapestry designs he did complete, which were intended for the king's study in the Escorial, reveal a flash of sarcastic humor. In one, for example, laughing young women are throwing into the air a straw manikin that looks like a man without a will of his own (right). Another design shows the guests at a wedding laughing at a mismatched couple: a pretty young girl and an ugly old man. 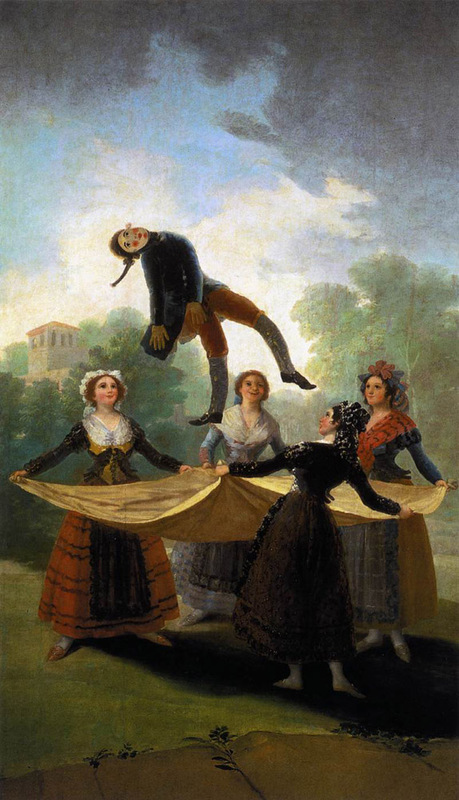 The games of masquerade and deceit between the sexes were to occupy Goya a great deal. In a winter landscape, peasants cloaked only in thin wraps are struggling through a snowstorm. Behind them, a donkey is trotting, laden with a freshly slaughtered pig. The intense feeling of cold is enhanced by the ice-gray tones. Suchan image of harsh weather was certainly an unusual subject for the decoration of a dining room, but it hung opposite a summer harvest scene that, with its warm yellow tones, provided a contrast. When compared with Goya's earlier cartoons, this tapestry design demonstrates a marked stylistic change. Instead of juxtaposing sharply contrasting areas of luminous colors, he is now using more subdued colors that blend into each other. An amazing study by Goya exists for this picture of an injured building worker. In it, exactly the same group of poorly dressed men can be seen, but their gestures show that they are carrying from the site not an injured mason but one who has had too much to drink. This picture, with the life-size dummy and the mask-like smiles of the women, seems odd and unreal. It is easy to see this scene as the depiction of a traditional theme: men as the playthings of women. Each year, on May 15,the people of Madrid celebrated the festival of their patron, San Isidro. On this day there was a procession to the saint's hermitage on the opposite bank of the Manzanares, to give thanks and make vows. After that came the entertainment, when young and old, rich and poor sat on the meadow by the hermitage. They ate and drank wine and snacks offered by peddlers, and partied late in to the night. One of the most popular and important festivals of the year, it was a wonderful theme for the tapestry designs Goya was to supply for the bedroom of the royal princesses in the El Pardo Palace. He wrote to Zapater: "The themes are very difficult and require a lot of effort, especially The Meadow of San Isidro on the saint's day, with all the disturbance which is generally accepted as normal on these occasions. "In one design, the hermitage church can be seen; and a second composition, a panorama, shows the meadow crowded with festively dressed "pilgrims." Because of the death of Charles III, these sketches were never executed as tapestries, but remain intact and were acquired a short time later by the Duke of Osuna to hang on his walls. 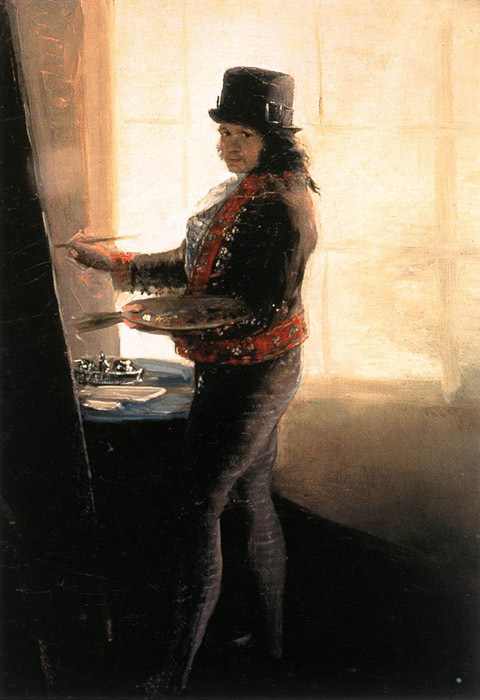 This suggests that Goya's contemporaries already valued his oil sketches as independent, legitimate works of art. The broad format of the design for The Meadow of San Isidro shows one of Goya's few landscape scenes. In the late afternoon light of a spring day, we can recognize the outline of Madrid on the other side of the river, from which, the block-like royal palace emerges on the left. Further right is the large dome of the church of San Francisco el Grande. On this side of the Manzanares the city's inhabitants have settled on the meadows by the riverbank and on the hillside in the foreground. In the front row we see elegant women talking, protecting themselves from the sun with their silk parasols. To the right, a brightly dressed maja is pouring out some wine for a young man. 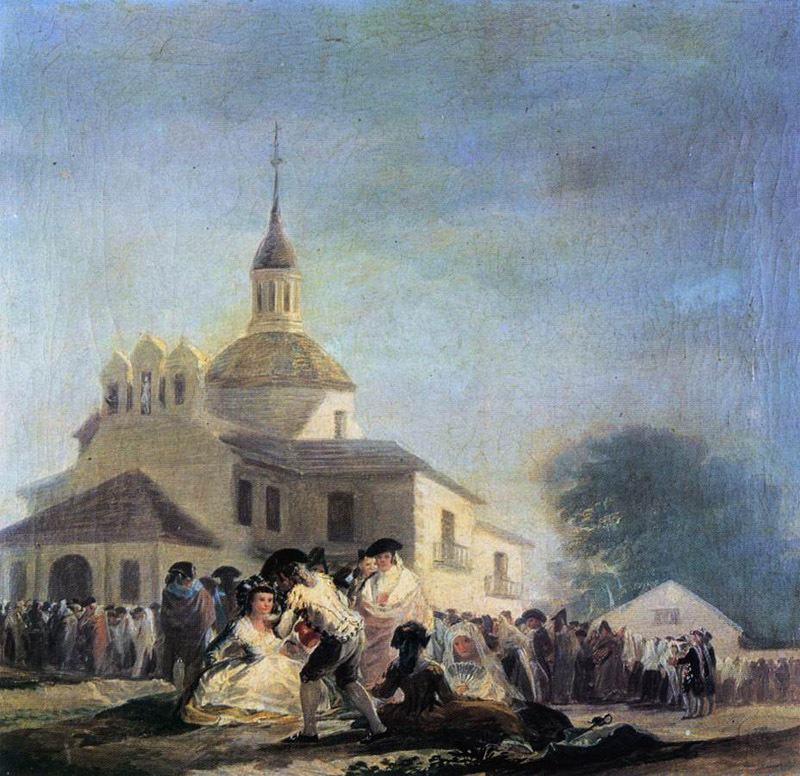 Goya depicts the colorful bustle in the center ground almost in the style of a miniature; the coaches of the wealthier Madrid citizens are shown lined up awaiting their owners. Here and there, groups have congregated to dance a lively seguidilla. There is nothing to recall the religious origins of the outing; this pilgrimage is devoted to pleasure. Goya captured the atmosphere of the spring day in soft mother-of-pearl tones. Stronger tones and gleaming white make the figures in the foreground stand out, while the outlines of the city in the background are limited to subtle shades of light blue, pink, green, and ivory. This finely harmonized color scheme also lends the landscape a strong sense of perspective. About 35 years later Goya created a dark contrast to this bright impression of San Isidro's Day, when he painted the walls of his own country house with his oppressive black paintings. Similarly, the composition he selected for the Pilgrimage of San Isidro was also an extremely broad format, but the happy, peaceful world of the tapestry design has been replaced by one of inconsolable gloom. The pilgrims are now crowded together, jostling in a huddled procession that is coming out of the picture towards us. The gaping mouths of the distorted faces are open in a gruesome song. This submissive, fanatical mass of humanity seems no longer capable of any rational action.